Her work has been seen internationally at venues which include the Issue Project Room, and Alternative Museum New York City, Galerie Mario Mazolli, Sowieso, and Quiet Cue in Berlin, the Room Series, and Meridian Gallery in San Francisco, the Center for Experimental Art and the Aram Kachaturyan Museum in Yerevan, Armenia, International Women's Electroacoustic Listening Room Project at Bimhaus in Amsterdam. .
Thea is a former member of the Berkeley Symphony orchestra where she played under Kent Nagano for ten years. She has an M.A. in Interdisciplinary Arts from San Francisco State and an M.F.A. in Electronic Music from Mills College. In 2009, she was a lecturer in the Art Department at the University of California, Santa Cruz. Thea's work has been seen internationally at venues which include the Issue Project Room, and Alternative Museum New York City, Galerie Mario Mazzoli, Sowieso, and Quiet Cue in Berlin, the Room Series, and Meridian Gallery in San Francisco, the Center for Experimental Art and the Aram Kachaturyan Museum in Yerevan, Armenia, International Women's Electroacoustic Listening Room Project at Bimhaus in Amsterdam. 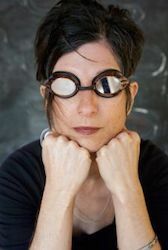 She has received a Zellerbach grant to do sound for experimental video, and has also been a curator of experimental video. In 2002, she co founded the Armenian Film Festival in New York City and later co curated the festival when it was bought to San Francisco. Thea is a former member of the Berkeley Symphony orchestra where she played under Kent Nagano for ten years. She has an M.A. in Interdisciplinary Arts from San Francisco State and an M.F.A. in Electronic Music from Mills College, and studied Arabic classical music with Simon Shaheen. Thea Farhadian. All rights reserved.